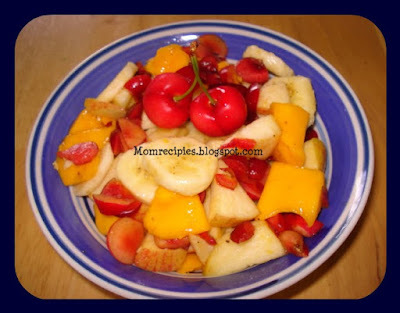 Fruit salad is a dish consisting of various kinds of fruit.Fruit salad can be served as an appetizer, a salad, or as a dessert.Just a little bit of chaat masala added to fruit salad makes it incredibly yummy and tasty. In a large bowl mix together all the fruits. Add lemon juice, salt, sugar and chaat masala and toss well. Serve immediately or Chill for a few hours and serve chilled. Such a beautiful and colourful platter looks delicious.